We are defined by our choices, big and little. On a daily basis we choose – whether (or how) to react to a coworker; if we’ll fulfill our promises and obligations; to exercise or sit on the couch; to smile at strangers (and loved ones) and enjoy the day or to pretend they’re not there; to take actions toward what we want…or not. It is these choices, some of which are conscious and some of which happen without our even realizing it, that are the essence of who we are and what we achieve. Sometimes I find myself mindlessly going through my day. I had promised myself (or challenged myself) that I’d make it through the day with a better attitude and no complaints. I had sworn that I’d be intentional all day and make time for the things that were important to me. I was certain that I would show up as a model of all I teach and share…and then my day simply happened without my knowing it. I looked back and realized that knowingly or unknowingly, my choices throughout my day did not seem to reflect the “me” that I was determined to be. I can easily go through my day and get so much done. I can shine in my areas of expertise and accomplishments. But it’s my choices – the big and little, conscious and unconscious – that show my true values, my true worth, and who I really am. Be more conscious of all your choices – big and little – and let them guide you to be the person you aim to truly be. What are your choices saying about you? Is it what you want them to say? 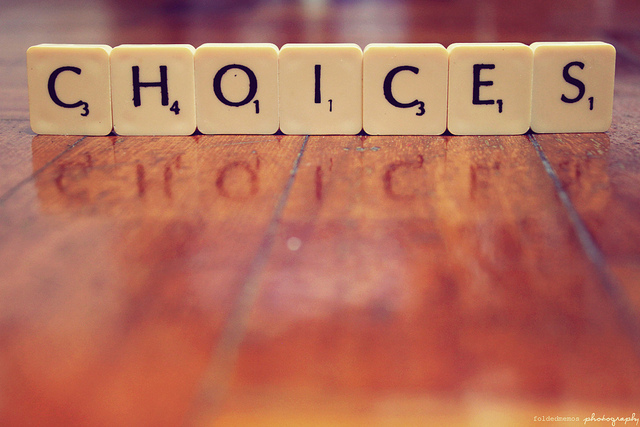 For partnership in making the choices that will move you forward, contact Robyn at rmcleod@chatsworthconsulting.com. This is being authentic, making positive choices as a matter of course. Leadership stands or fails on personal authenticity, transparency and empathy. Other choices are strategic rather than personal or authentic. Thank you for your comment, Bill! Authenticity is certainly key to great leadership and sound choices.